New Delhi: Populist measures, a divided and sometimes fractious opposition and a popular chief minister have helped the Bharatiya Janata Party (BJP) retain power in Madhya Pradesh, although the party won 37 seats less than it had in 2003. 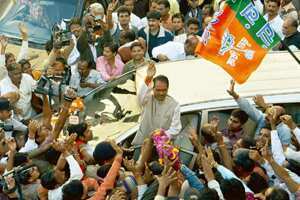 BJP’s campaign was built around Shivraj Singh Chouhan, 49, who became chief minister in 2005. Analysts had expected charges of corruption against several ministers in Chouhan’s cabinet, the so-called anti-incumbency factor where an electorate is supposed to be unhappy with the government of the day, and the presence of smaller parties to be significant factors in the polls. As it turned out, none was. One expert said the Congress had failed to even put up a fight. “The Congress.... was out even before the real game began. The BJP managed to retain power despite being one of the most corrupt governments (in the country)," said Shyam Awasti, editor of Bhopal-based weekly Sputnik in a phone interview. The Congress’ effort to have its campaign in the state managed by former Union minister Suresh Pachauri may have also flopped with voters, said a Congress leader who did not wish to be identified. “Pachauri could not galvanize the already faction-ridden party." However, former chief minister Digvijay Singh said voters in Madhya Pradesh could have been influenced by the terror strikes in Mumbai on the eve of elections. Meanwhile, a BJP leader said his party’s wins in Madhya Pradesh and Chattisgarh, a state carved out of Madhya Pradesh in 2000, showed that it was the only alternative to the Congress at the national level. “Winning Madhya Pradesh and Chattisgarh proves that we are still the only national alternative available to the Congress," BJP’s Rajiv Pratap Rudy said. Analysts also attribute BJP’s victory at least in part to populist measures such as the Ladli Lakshmi Yojana and the Kanyadan Yojana, targeted at women. Under the Ladli Laxmi Yojana, National Savings Certificates worth Rs6,000 are purchased in the name of a new-born girl and a further Rs24,000 in equal amounts over the next five years. A sum of Rs1.18 lakh would be paid to each beneficiary on reaching 21 years of age.